Samaritan Medical Center in Watertown, NY is excited to announce that Adeline has been named our local Walmart and Sam’s Club Children’s Miracle Network Hospitals Ambassador. 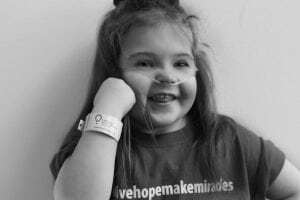 Adeline will serve as a fundraising and awareness ambassador for Samaritan Medical Center and for Children’s Miracle Network Hospitals. Adeline was diagnosed in utero with a severe congenital heart defect. After she was born, doctors performed genetic testing with a portion of her umbilical cord and found a piece of her 22nd chromosome to be missing; she was diagnosed with Velocardiofacial Syndrome. September 9, 2015 was Adeline’s first open heart surgery. And what now feels like a blink of an eye, Adeline’s cardio team is currently in the process of planning her next open heart surgery that will take place this year.